Staples Center celeb sightings were pretty fun, if random, last night, with Ashton Kutcher, John McEnroe, David Beckham, and Gerard Butler (gone blond) lighting up courtside with their wattage. 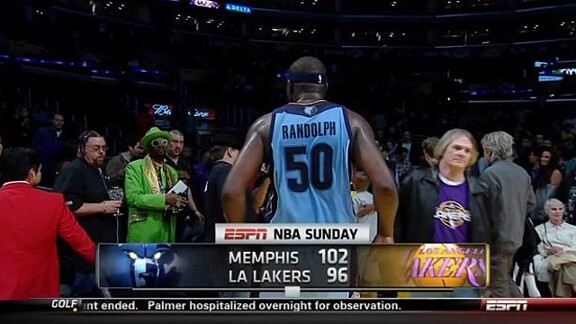 But the best appearance of the evening went to a man who seemed to be cheering for the Grizz: Snoop Dogg compatriot Don Magic Juan. Don’t know if there’s ever been a better union of team and fan. Oh, and he seemed to have a preexisting relationship with Zach Randolph, because of course he did. This entry was posted in ALDLAND and tagged bob seger, don magic juan, grantland, grizzlies, john mcenroe, lakers, los angeles, memphis, nba, zach randolph by AD. Bookmark the permalink.